The point is the defining part in a fountain pen. A bad one ruins an otherwise attractive pen, a good one elevates an otherwise hideous wreck. Slit: The important thing, that which allows the point to act, the slit transmits the ink from the feed via capillary action. The slit should never widen towards the end, as this will starve the tip for ink– in firm pens, its walls can be parallel, while in flexible ones they should (at rest) taper towards the tip. Some pens with extremely wide points may have more than one slit, to prevent ink starvation at the far edges. Tines: These are really just a side-effect of the slit. The exact shape of them has a role in how well the pen flexes; as a general rule, longer and thinner tines, relative to their own width, make for more flex. Tipping: The actual contact between point and paper– historically, the “nibs”, a term which has grown to include the whole point. Any roughness or misalignment will make for misery in use. A point may have tipping applied by welding, in which case it is generally called “iridium” although a variety of similarly hard metals and alloys are more likely to be used in modern pens. In some less expensive pens, the tipping is made of the same stuff as the main body of the point, either turned down like a jelly-roll or folded in like the boards of a book. Shoulders: The outermost edges of the tines. 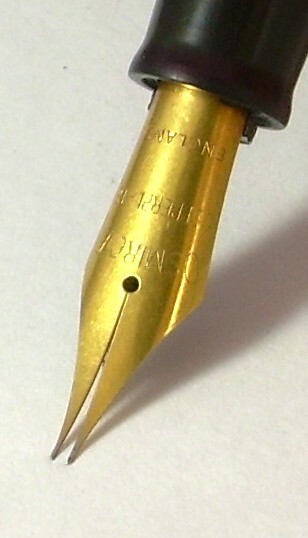 In some more modern pens, the shoulders are bent downwards for reasons of either alignment with the feed or re-inforcement; these are “winged” points. 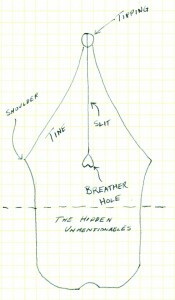 Breather: A hole at the end of the slit with a couple of purposes. The name comes from the role it plays in allowing air back up the feed, but an equally if not more important purpose is to act as a stress-distributor, preventing the slit from tearing longer (a similar feature is often found at the end of slits in leather). This item does not appear in all pens, most of which seem to function reasonably well in its absence, but I find I don’t fully trust flexible points without a breather. Open vs. Hooded vs. Annular vs. Inlaid vs. Inset: The Parker “51” was a great trouble maker, introducing as it did a distinction between points as they had been ab initio, now dubbed “open” points, and hooded ones. 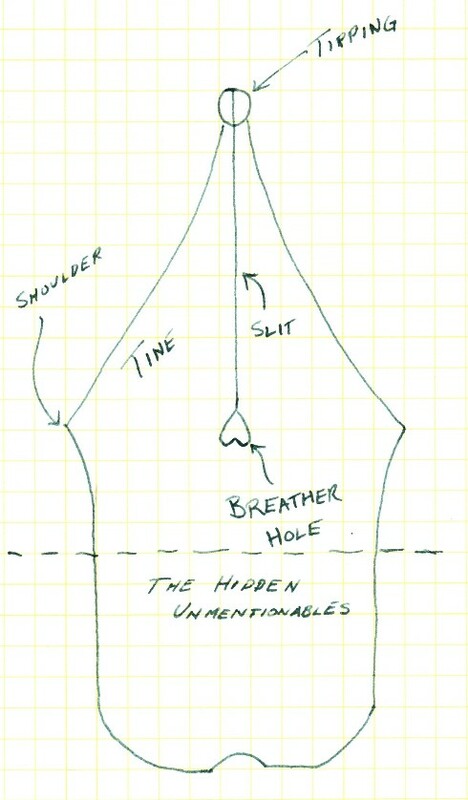 The shape of the hooded point is slightly different from that of the open point, as most points of this sort are tubular, but the gross anatomy is the same– the main distinction is that the gap between the shoulders is much smaller than the distance across the widest part of the point. Hooded points are, of course, mostly concealed by their shell, with only the tipping and a little tine showing. The other trouble-makers in considering points are both Sheaffer inventions– the annular Triumph point, and the inlaid point. While they are of funny shape, the same general anatomical features obtain. In the former, the base of the point is just extremely broad, while in the latter it tapers to a point. Sheaffer may be blamed for both. While I’m on the topic of these points, I want to draw attention to the upward bend found on both of these styles in Sheaffer’s pens; that’s meant to be there, and straightening it out is an act of vandalism that will likely render the pen unuseable. Two styles of point are not removable from the rest of the pen. In inlaid points, the point is fused to the shell. The other is the integral point, in which the point is just a continuation of the same material as the section. Owners of either sort are advised to be careful with them, as the possibility for repair is somewhat limited. The final variation in points are the semi-hooded and inset styles. Both both have a proportion of the point hidden by the section, and inset points can be of quite whimiscal shapes. The main distinction between them is that the semi-hooded point will be more enveloped in its mounting, while an inset point will be flush with the section for the appearance of the inlaid point, as seen in this pen. Materials: Almost every point you will come across is made of either steel or gold. Steel has been the less expensive metal of choice since before fountain pens were invented, being relatively easy to produce points in. The problem with steel is that it can rust, and since in pens it is generally lying up against a more or less corrosive or caustic fluid, this can be a serious problem. 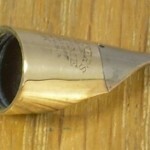 In the past, this was mainly addressed with gold plating to limited success. Modern alloys of steel are a good deal more resistant to ink damage, although I still urge regular cleaning as a means of preserving the point. Gold’s main attraction as a point material is that it lacks steel’s main vice– it is extremely resistant to extremes of pH. Its principle drawback is that is it soft, given to bending rather than flexing. Historically, 14 karat (or carat) gold has been the choice for pen-makers (in the European system, that’s 585, or 58.5% pure gold), which costs less through being rather less gold, retains a high degree of corrosion resistance, and depending on the other elements being added to the mixture can be extremely resilient. Modern makers tend towards higher gold contents, 18k (or 750) being fairly standard, in part to please some national regulations about what one may advertise as “gold” and in part because the conversion of fountain pens from tools to luxury items urges more “upscale” materials upon the makers. There are some pens with 21k/875 points, which I think I might hesitate to actually use, and during a strange “carat race” among Japanese makers in the 1970s some pens appeared bearing points of 23.99k which is just plain silly. Plating is also used on gold points, but its use is decorative rather than protective. In general, there is little performance difference between steel and gold, since it is the tipping that actually contacts the page. Steel points tend to be firmer, but the preference for gold tends to play as much to the placebo effect as to any demonstrable superiority of material. You’ll note that I started the discussion of materials with the word “almost.” There are some other materials used, of more or less exotic natures. Some companies have used a palladium-silver alloy (palladium is in the same periodic column as platinum, and helps to resist corrosion), some have used and are using titanium, and some used glass. The glass point is an exception to almost everything mentioned previously. Glass points look like fake candle flames, and have no slits. The convolutions in the surface of the point act as feed and slit combined, with ink coating each of the valleys. The advantage to the user of a glass point is that there is no right way up (or, really, several to choose from) and it is possible to write through carbons without fear of over-flexing the point. The disadvantage to the user is that it is, in the end, glass and heir to the issues of that brittle substance, and also that it tends to use ink in great buckets-full. The advantage to the manufacturer is, or was since these are uniformly vintage items, the fact that glass is a lot cheaper than even unplated steel and will never draw angry buyers complaining about rust. Size and shape: I speak here about the tipping. The overall dimensions of a given point are neither here nor there functionally, although a point that is radically out of scale with the pen it’s mounted in is bound to look silly. 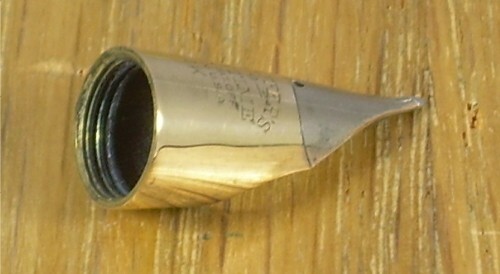 A lot of vintage points, most notably Waterman, had a numbering system for size in this respect, and the number printed on the back of the point has nothing to do with the size of the line– a Waterman #6 point is longer tip to base and wider across the shoulders than a #2, but both may put down exactly the same sort of line. The size of the point most people concern themselves with is the width of line it produces. This size is usually given in rather vague terms, with most modern pen makers offering broad, medium, fine and extra-fine, and a few offering a grade or two extra at either end of that scale. A problem exists here, in that each maker of pens has their own idea of what each of those sizes actually means in terms of absolute measures width. In general terms, western pens tend to be rather wider than eastern– a fine from Waterman or Pelikan will look rather like a medium from Pilot or Hero. Vintage pens also tend to run finer than modern, although they are also more mysterious than modern pens about their sizes, since the latter frequently print some kind of indicator like “XF” or “B” on them, while the former relied of informed sales people to help the buyer get the size which suited them and didn’t mark the pen in any permanent way. There are also a few different shapes of point to consider. For the most part, a standart writing pen will come with a more or less rounded tip– the more rounded are actually also known a ball-points, althought to avoid alarm German is frequently resorted to (kugelspitz) by non-German-speaking fountain pen fanciers. Roughly speaking, the rounder the tip the smoother and more tolerant of rotation it is. One also finds flattened points of in three rough categories, stub, cursive italics and “crisp” italics. The second of these is usually an after-market reshaping rather than something offered by manufactures, but all three are designed to add some extra distinction to the writing by varying the width of the line depending on the direction of the stroke. This is pursued in depth in the writing instruction area, so I will limit myself here to mentioning that as one moves from stub to italic, the corners of the tips become more square, which gives better definition to the distinction between wide and narrow at the price of writing speed and comfort. One can write with an italic pen, but it is intended as more of a tool of art than a straight writing implement. There are two other specialty points one may find. One is an “Asian calligraphy” point, sometimes called a “fude” or “fudemanen” point by Japanese makers, and it looks for all the world like a point that has been bent upwards through dropping. This shape provides a broad inky footprint, which a skillful person can use to simulate the brushes traditionally used in eastern Asia for writing and calligraphy. The second is diversely called an Arabic, Hebrew or Semetic point, depending on who one wants to alienate or antagonize, and it is something like an italic point up on end. Middle eastern writing styles apparently prefer broad cross-strokes rather than the European inclination to wide verticals, so a point of this sort is shaped with the slit contained between parallel lengths of tipping. Some seeking to avoid possible offense will also call this an “Architect” point. Flexible, Soft, Springy or Firm: Those who start getting serious about fountain pens will, in their reading, happen upon the idea of the flexible pen. There is, indeed, a certain amount of myth-building around the flexible point and its powers to make handwriting look magnificent . Handwriting performed using a flex point can certainly look wonderful… if the person using it knows what they’re about. It’s not magic. A flex point, showing off. Flexible pens in the sense the word was used before 1950 are made by almost no one today– one bespoke maker claims to do so, and I haven’t had a hands-on test to confirm or contest the claim. Made initially to imitate the properties of earlier dip pens, which in turn were emulating quills, flex points get their powers from specific treatment in the tempering and forging processes. They were dropped by most makers because a flexible pen is one which courts disaster through fatigue in the metal. A truly flexible pen will flex under the tiny extra pressure brought on by a down-stroke, and can vary in line width as much as ten times from closed to open, but without careful handling they might stay open or even snap; responding to warranty complaints about flexible points is more than most pen makers feel like living with. Springy points can mislead an inexperienced user into thinking they’re flexible; technically, they are, but in terms of writing, they are not. They are more likely to appear in a higher-end pen than an inexpensive one, and the give inherent to them is not designed to allow line variation (although it will, to a much lesser degree than flexible points) but rather to act as a shock-absorber. They damp the feedback induced from the tips travelling over paper, and enhance the sense of smoothness. Soft points are a specific grade of point offered in some Japanese pens. In effect, they’re much like springy pens, but the intention is to simulate the sensation of writing with a brush; similar to the flexible’s harking back to quills, but rather more Japanese people practice writing with a brush than people in the west pursue goose-based writing tools. These points tend to allow for a little more line variation than other makers’ springy points, but like a flexible point they ask that the writer actually understand what the pen is capable of. Soft and springy points alike draw people seeking flexible writing into error; there are plenty of lamentations in on-line communities about the tragic crippling of Lamy 2000s and Namiki Falcons. The latter are somewhat more often a victim, because they look like they should have more flex than they do. Firm points are not particularly mysterious. The tines remain together under pressures great enough to allow a ball-point to write. Line variation doesn’t occur. They are built to survive relatively high pressure from users more used to the demands of ball-points, and while not enjoying the cushioning effects of springy points are certainly capable of pleasingly smooth writing. For example, most Sheaffers made since 1960 fall into this category, and they still enjoy a reputation for smoothness. I say that springy points are more likely to be found in more expensive pens, and the other side to this coin is firm points being more a presence in inexpensive pens. The cushioning effect of a springy point gives an extra sense of luxury, and the point’s greater susceptibility to damage is balanced by a user being more careful with an expensive object and having paid enough more above the basic materials costs to make warranty claims less of a burden. This is not to say that there are not some excellent pens with firm points; the Parker 51 is probably the most famous example. It should be understood that all these terms are a little mushy, descriptive of regions in a spectrum of flexibility rather than specific settings on a rachet-clicking scale. Some firm points have a little spring in them. Some soft points will write through three carbons– there were, three or four generations back, “mani-flex” points designed specifically for such tricks. At the far ends of the spectrum are “nails” and “wet noodles”.